42 brothels in a two-block area. Today, a new business and its owners hope to bring new life to the same neighborhood. Chris Barnard, president of a new micro-brewery called the Great River Brewery, says the business in the odd-shaped corner of 2nd and Iowa streets is ready to open in what was a former Christian coffeeshop that recently closed. For many years before that, it was the AAA Muffler Shop. Co-owners Scott Lehnert and Paul Krutzfeldt had owned and operated Old Capitol Brew Works restaurant/bar and brewery in Iowa City until moving the brewery operation to Davenport. Barnard, of Davenport, said they are leasing the building plus a smaller building to the north that is used for cold storage and the canning operation. Hy-Vee, Schnucks and Jewel by July 1,” Barnard said. 25 local taverns and restaurants. Beer will begin shipping to many of those locations Monday, he said. Bottling and canning the beer will be unique to this area for micro-breweries, he said. Barnard said the city of Davenport has been wonderful to work with. And he said this ownership group and city officials believe the business could help spur more growth in the area. “Everybody has been real supportive,” he said. “In the block, they are lacking tenants. We would love to see restaurants and a bike shop. Tom Flaherty, senior vice president, community growth for DavenportOne, said he is happy with the brewery and what it could mean for future growth. “We are very excited to have it,” he said. “It is another example of growth in downtown Davenport. These are some of the amenities for growing the residential element of downtown. The downtown is really exciting right now. There is a lot going on, and the festival season is coming up, too. “There are over 700 apartments downtown, and that has more than doubled since 2000,” Flaherty said. Matt Flynn, the city’s senior planning manager, also likes what the Great River Brewery brings to the downtown. He alluded to established businesses in the area such as Bucktown Center for the Arts, the renovation of the nearby Blackhawk Hotel, and the landscaping and development of a former gas station at 4th and Iowa streets. 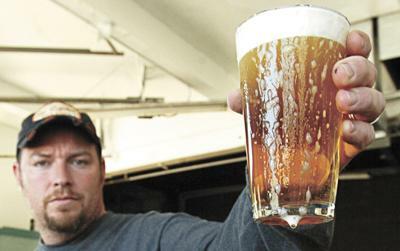 The Brewer’s Lounge, a small bar connected with the Great River Brewery operation, will open April 6 and be open 5-9 p.m. Monday through Friday and noon to 7 p.m. Saturday and Sunday. There also are plans to create an outside patio area. The business is using the services of Aaron Johnson, a student at Palmer College of Chiropractic, who worked 10 years as a microbiologist for Coors. He is establishing a lab here to be able to do regular cleanliness checks for the brewery. President Chris Barnard said they also hope to establish an internship program with Augustana College in Rock Island for microbiology students. Here are the five beers the Great River Brewery will produce in Davenport. 483 Pale Ale: American Style, brewed with pale malt and a touch of crystal malt which gives it a copper hue. Roller Dam Red Ale: Irish Style Red Ale, brewed with premium Maris Otter malt, blended with two types of crystal malt. Hops are a proprietor’s blend of two spicy hop varieties. Straight Pipe Stout: Milk Stout, premium Maris Otter malt for a strong base blended with English roast and lactose sugar, hopped with traditional English fuggles hops. Farmer Brown Ale: American Nut Brown Ale, mildly hopped to allow all the organic dark crystal, chocolate and biscuit malt to dominate the flavor of this malt brew. La Jefa Lager: Mexican Lager, Pilsner malt, a hint of cereal grain, traditional lager yeast and noble hops. The little red brick building at 4th and Iowa streets in downtown Davenport finally has snagged a new business. Most of us just have to wait before finding out what it is. “It will be up and running by June 1,” said Tom Flaherty, senior vice president, community growth for DavenportOne. Renovations are still under way, but Flaherty the new business will be a definite asset to the neighborhood. It is the former home of Wow Burger in the 1960s and 1970s and a gas station. Trees and bushes were planted last year on the hillside above the structure on the southwest corner of the intersection. The entire property is a triangular-shaped, nearly half-city block that was home to W.G. Block Co. since the 1880s until Block donated it to Davenport-One in 2007. Above and through the entire square city block is a railroad bridge that angles southwest from 4th and Pershing streets to 3rd and Iowa streets, splitting the block in almost a 45-degree angle. Gary Carter, the former senior vice president of Downtown Partnership, said at the time that the building is only 500 to 700 square feet. He said people were calling him saying they were interested in opening businesses such as a sandwich shop, coffee shop or ice cream shop. He also hoped it could provide staples such as milk, bread and meat for those who live nearby.